I usually do a lot of cooking on Sunday—I’ll make a big midday meal for my boyfriend and I, and sometimes our friends, and usually I’ll do what my mother calls “cooking for the week”. Sometimes I’ll prepare a big pot of soup, roast some vegetables, make a big pot of rice or farro. I portion everything out into plastic containers, and then I’m good to go—until Thursday night, when I’ve either run out of cooked food, or I’ve grown tired of leftovers. Last night, a quick glance of my unusually empty refrigerator gave me two ingredients: asparagus and zucchini. I couldn’t really make a meal of just those, so I went to the pantry. Behold! Pasta. On the counter, garlic. In the spice cabinet: red pepper flakes, black pepper, salt. Then I went back to the fridge, directly to the cheese drawer for some parmesan, and lo—I found an unopened package of chopped pancetta. I grabbed the asparagus and left the zucchini behind for another meal. There’s really no trick to this dinner—while the water boils, clean the asparagus and snap off the tough ends. Grate some cheese, chop some garlic. Once the pasta starts cooking, you can prepare the asparagus any way you like—steamed, sauteed, grilled or roasted. I’ve taken to pan-searing asparagus in my cast iron skillet. The method is simple, quick, and leaves the asparagus bright green and crisp-tender, with just a bit of char. I sear the asparagus spears whole, then chop into pieces. In another pan I cooked the pancetta (about 3 tablespoons) with the garlic and olive oil, adding just a splash of red wine to de-glaze the pan. Once the pasta was done cooking, I drained it and threw it in with the pancetta, added the asparagus, a bit more oil and then the cheese. A couple stirs, and I was done. Dinner for the evening, and enough to enjoy for lunch the next day. 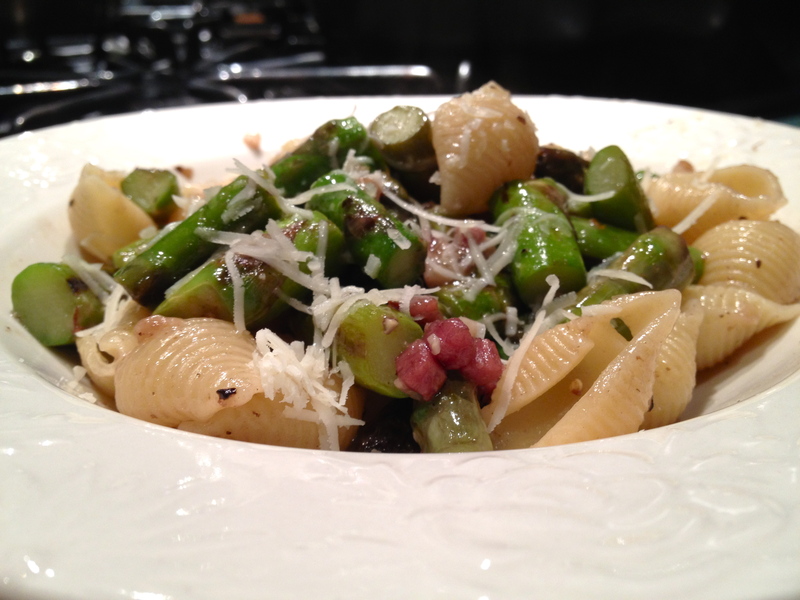 This entry was posted in Recipes, Savory and tagged asparagus, dinner, dinner for two, fresh, healthy, leftovers, light, mains, pancetta, pasta, quick, savory, spring veggies. Bookmark the permalink.